The Quincy girls’ varsity basketball team battled their way to a second place finish in the Live Oak basketball tournament this past week. Head Coach Kent Grammer’s Trojans defeated a mixed varsity/junior varsity team from Live Oak on Nov. 30 by a 46-30 final score. The junior trio of Anna Hollister, Lydia Morgan and Ashlyn Wingfield led Quincy in scoring with Hollister leading the way with 14. Seniors Kaylin Henderson and Morgan Fowler dominated the boards with 17 and 11 rebounds, respectively. On Thursday, Quincy won a hard-fought 46-34 victory over Marysville. Grammer’s squad was led by Fowler’s 21, Hollister’s 11 and Henderson’s 5. Quincy, again, worked hard on the glass with Henderson and Wingfield leading the team in rebounding. In Friday’s championship game, Quincy fell to the larger Division 4 Bear River High School from Grass Valley 62-40. Ashlyn Wingfield led Quincy with 13 while Hollister and Fowler chipped in 8 apiece. Freshman Laney Dunmore led a valiant last minute attack and finished with 6. Seniors Kaylin Henderson and Morgan Fowler were honored for their efforts by being named to the all-tournament team. Seniors Tessah Belcher and America Little added to Quincy’s effort with outstanding defense, hustle and leadership while the frosh trio of Jaeden Stephens, Sierra Soder and Laney Dunmore provided scoring, hustle and valuable minutes off the bench. The Quincy girls’ varsity basketball program very much appreciated the sportsmanship of all tournament participants, particularly the tournament-winning Bear River squad. Quincy next takes the court Thursday, Dec. 8, against Biggs in their first game of Portola’s Tiger Classic Tournament. To support these efforts, community members have engaged in a fundraising effort to buy the girls necessary equipment — such as warm-up tops and a first aid kit. 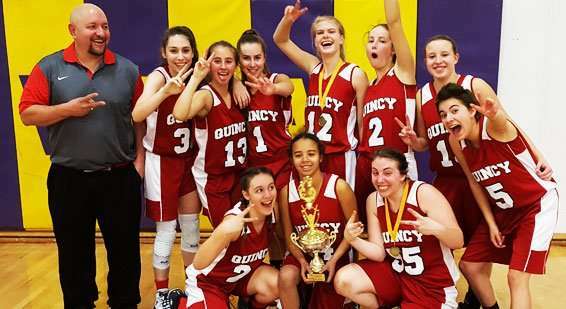 To join this effort and support these outstanding young ladies, donations can be made at gofundme.com/quincy-high-school-girls-basketball. Portola’s Kodi Lowdermilk drives to the hoop over the outstretched hand of a Mesa Verde player in the Tigers 77-64 loss to the Mavericks. The Portola Tigers’ basketball team went 1-2 at the Quincy Tip-off Tournament this past weekend. The Tigers opened the weekend with a 77-64 loss to Mesa Verde on Thursday night. Kodi Lowdermilk led the way for Portola with 13 points, followed by Dominic Vukobradovich with 12. Ricky Johnston and Antonio Maddalena both added in 10 points. On Friday night, Portola easily handled rival Quincy High in a 53-32 victory. The Tiger defense held Quincy’s normally explosive Crowe Herbertson-Deemer to just four points. “We did a great job defensively,” said Portola coach Tim Brubaker. “Dom (Vukobradovich) did an excellent job containing Crowe.” Maddalena led the way for the Tigers with 14 points and 12 rebounds, including going two-for-three from 3-point land, followed by Lowdermilk with 12 points and six assists. Saturday afternoon brought an incredible comeback after the Tigers fell behind Etna 38-13 at the half. Portola came roaring back in the second half of play and fell just short, losing 57-50. Once again, the duo of Maddalena and Lowdermilk led the way for Portola. Lowdermilk racked up 12 points, while Maddalena chipped in 11 points and 13 rebounds. Portola visited Chester yesterday; results will be available in next week’s paper. Portola looks to win its home tournament for the third year in a row when the Tigers host Biggs, Modoc and Quincy this weekend in the Tiger Classic. Portola plays against Modoc on Thursday, before facing Biggs on Friday and ending the tournament Saturday night against rival Quincy. The Chester boys’ varsity basketball team started its season off right last Tuesday night with a home game victory against neighboring Westwood. The Volcanoes took a commanding lead early on. Chester held the Lumberjacks to only 7 points in the entire first half. With a 29-7 halftime lead, Chester continued to pour on the points on the offensive end, while maintaining the same defensive intensity the crowd saw in the first half. The tough Volcano defense stood strong the remainder of the game to take the win 69-22. Second-year varsity player Brandon Dye brought the NBA moves to town with his three dunks, wowing the crowd throughout the night. Dye led the team in scoring with 20 points. Three-year varsity player Sawyer Durkin finished the night with 13 points while Brandon Ackerman found his rhythm from beyond the arc, knocking down four 3-pointers. All nine players on the Chester roster scored in the game, setting a great example of teamwork. The Volcanoes participated in the Fall River Block F tournament this past weekend. Chester started out the tournament with a 50-37 win over Hayfork, but lost its last two games, 61-55 to Trinity and 60-41 to Modoc. Chester hosted county foe Portola yesterday. Results will be available in next week’s paper. 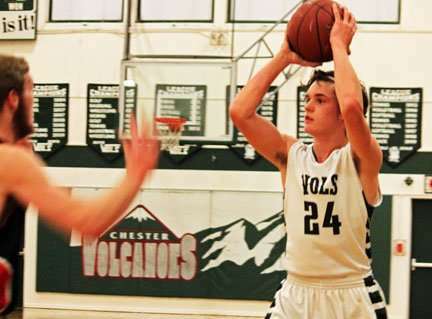 The Volcanoes’ next games will be this weekend in Chester as the Vols host East Nicolaus and Big Valley in the Chester Mountain Pride Tournament. The Quincy Trojan basketball team lost all three of its home tournament games last weekend to fall to 0-4 on the season. The Trojans fell to Etna High School on Thursday night by a score of 70-31, before losing to Portola 53-32 on Friday. Quincy rounded out the weekend with a 62-23 loss to Mesa Verde. The Trojans took on Lassen High School at Lassen yesterday. Results will be available in next week’s paper. Quincy participates in Portola’s Tiger Classic this weekend. The Trojans play against Biggs on Thursday, before taking on Modoc on Friday and rival Portola on Saturday night. The Chester High girls’ basketball team finished its weekend at the Biggs tourney 2-1. The Lady Volcanoes first defeated Hamilton City 36-26 on Thursday, before falling to Biggs 39-19 on Friday night. On Saturday, the Lady Vols topped Portola 49-32. Chester and Portola faced off again yesterday in Chester. Results will be available in next week’s paper. The Greenville girls’ basketball team took third place in the Greenville Invitational this past weekend. Greenville defeated Herlong 55-18, on Thursday, before falling to Redding Christian 77-36 on Friday night. On Saturday, Greenville defeated Herlong 47-26. Loyalton won the tournament title with a 3-0 record. Tournament MVP was Rachel Peterman of Loyalton. All-Tournament players for Greenville were Shasta Banchio and Hannah Lambach. The Greenville High boys’ basketball team grabbed a second place finish at the Greenville Invitational this past weekend with a 2-1 record. The Indians took down Happy Camp on Thursday evening by a score of 50-23, before defeating Herlong 47-12 on Friday night. The only loss of the tournament came in the Championship game against Redding Christian, where the Lions defeated the Indians 47-25. All-Tournament players for Greenville were Sheridan Kusel and Zack Pew. Shalee Purin contributed to this article while David Hollister submitted the Quincy girls story.